This page shows an exciting assortment of jewelry that incorporates pearls in its designs. Pearl is the birthstone for June, along with Moonstone and Alexandrite. Pearls are not gemstones produced in the earth, they are created by living mollusks (such as oysters, abalone and mussels) in either the sea or freshwater by the production of nacre (mother-of-pearl) around an irritant. Most pearls are cultured (as opposed to found randomly in nature), with color determined by species of mollusk and environment. Freshwater pearls are found in lake and stream mollusks. Brushed satin finish on simple and lightweight sterling earrings, cut into open lantern shape, accented with small white pearl. Measure 7/16 inches across, 7/8 total length on 1-piece earwire. 14 karat yellow gold small flowers, delicately (but strongly) beautiful, measure about 1/2 inch, and have 3mm white cultured pearls set into their center. Earrings are post style. Matching pendant has bail loop hidden in back, chain is not included. By SUSAN KINZIG, strong modern design in sterling silver. The shapes are framed with heavy gauge sterling sheet about 3/16 inch wide, oxidized dark and smooth on the outside. Inside metal is patinae green, with white pearl and grey beads. At bottom swings another white pearl. Pierced, 5/16 x 1-1/2 inches. From The Touch jewelry studio, these leverback style earrings are simply elegant with 4mm white pearls. Set in 14 karat yellow gold, the hinge at bottom of earring that allows loop to open is smooth and inconspicuous in fine design. Drop about 5/8 inches. 14KT WHITE GOLD delicate chain is joined to clusters of PEARLS in gray and white color, with larger 14mm COIN PEARLS that have rich nacre in peacock/pink in the gray. 30 inches long with clasp. 1-3/8 inches long on sterling earwire, the SILVER PEARL glows coolly above the spiral of heavy sterling sheet that has impressed patterns. Spiral will spin freely from top center where it attaches. 2-1/8 x 1-1/2 inches, polished pewter in the form of a nautilus shell has the spiral emphasized with soldered brass wire. A rim of bronze FRESHWATER PEARLS is attached gracefully with wire, vertical barpin in back. 1-5/8 inches long and slender 3/8 inch wide, hammered and polished pewter disk has ring of soldered brass that holds the dangles with white pearls. Surgical post. About 2-1/4 inches long on french earwires, 1-1/14 inch across, aluminum has been curved and hammered into shape, a large white pearl adorning the center. Lightweight for their bold size, finished in pewter color. 17 inches long, goldtone magnetic clasp for easy on and off, made on goldplated wire that you can bend to fit your neckline perfectly! Tiny bronze iris beads make the back of necklace comfortable. 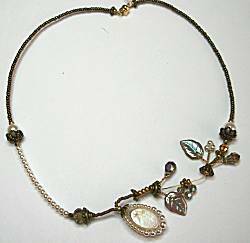 Spanning the front 7 inches are antiqued bronze metal beads that add the vintage look, twisted wire extends out to capture smoky gray AB crystal beads, shiny fire-polished glass leaves, and the flat oval pearl encircled by white glass pearls. Wire tendrils extend delicately outward up to 3/4 inch. 13mm flat round white COIN PEARLS have satiny luster, dropped from delicate 14kt gold chain with gold hammered disk charms. 2-1/4 inches long on leverback earwire. 7/8 inch ring of polished sterling silver has embossed patterns on it, suspended from earwire with large WHITE PEARL. 1-3/4 inches dangling length. 1-3/8 inches long on sterling earwire, the WHITE PEARL rests atop a spiral of heavy sterling sheet that has simple impressed patterns. Spiral will spin freely from top center where it attaches. A pair of KEISHI PEARLS in silvery pearl color, have the naturally irregular nacre surface, with not much hint of other color though shiny. Joined in pure silver electroformed setting with GARNET, AMETHYST, and GREEN TOURMALINE crystal point. Ring extends 1-1/8 inch lengthwise on finger, band is 3/16 inch wide in back. Size 8.25. 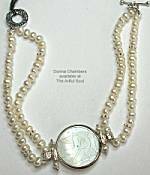 A domed top has shiny silver background and gold vermeil wire details, sporting a 6mm white PEARL in charm below. 1 inch long with sterling post 1/8 inch below top edge. 2-3/4 inches long on earwire, 7/8 inch across. Aluminum is turned and hammered into the figure-8 "ocho" shape, finished in antiqued bronze color, with an extralarge white pearl captured in the top loop. Lightweight and mathematically elegant! Sterling silver Asian-inspired frame measures about 5/8 inch across, holds a trapezoidal porcelain body in its center. Suspended below sterling silver french earwire, 1-1/2 inches long overall. White pearl accent at the bottom. Apache has a pebble pattern of dark and golden browns with white stripe and red dots angling through the center. 1 inch long, 5/8 inch across. Sterling silver bezel cups hold the irregularly shaped biwa white PEARL and faceted BLUE TOPAZ and IOLITE stones. A gracefully curving wire with gold vermeil finish winds around them all. Sterling post 1/4 inch below top. 1-7/8 inches long on goldfilled earwire, 11/16 inch across. The extravagant endless loop charm has the naturally beautiful white COIN PEARL dropped below, its dimpled surfaces catching the light with subtle blue/pink highlights. 2-5/8 inches long on goldfilled earwire, 1/2 inch across. A pair of goldfilled infinity curves are hammered flat and joined by jump ring, twisting slightly with elegant COIN PEARL dropped below. The pearl has the naturally irregular surface nacre that glows subtly with pink and blue on white. 12mm GRAY COIN PEARL has satiny luster, suspended from delicate 14kt WHITE gold chain. The white gold post top has tiny DIAMOND accent. 1-5/8 inches long. 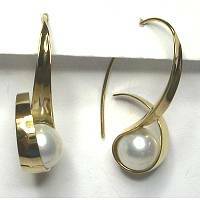 WHITE PEARLS up to 6mm in size dangle freely from a 14kt yellow gold twisted tube, wire-wrapped securely. 1-1/2 inches long on earwire.